Law of effect: reinforcement increases the strength of a connection, punishment does not change it.
" Give the pupils something to do, not something to learn; and the doing this is of such a nature as to demand thinking; learning naturally results." "the teacher must adopt the role of facilitator, not content provider"
Constructivism - Equilibration PiagetEducational environments should provide the opportunity for discovery by students. Situated Cognition/Learning John Seely -Brown (1940) Allan Collins, Paul DuguidLearning is embedded in the activity, context and culture it was learned. Learning is about performance in situations rather than accumulation of knowledge. "instead of pouring knowledge into people's heads, you need to help them grind anew a set of eyeglasses so they can see the world in a new way." Powerful ideas and wonderful ideas- power of computers in the classroom lies in their potential to assist children in encountering powerful ideas and engaging them with experimenting and testing their ideas. 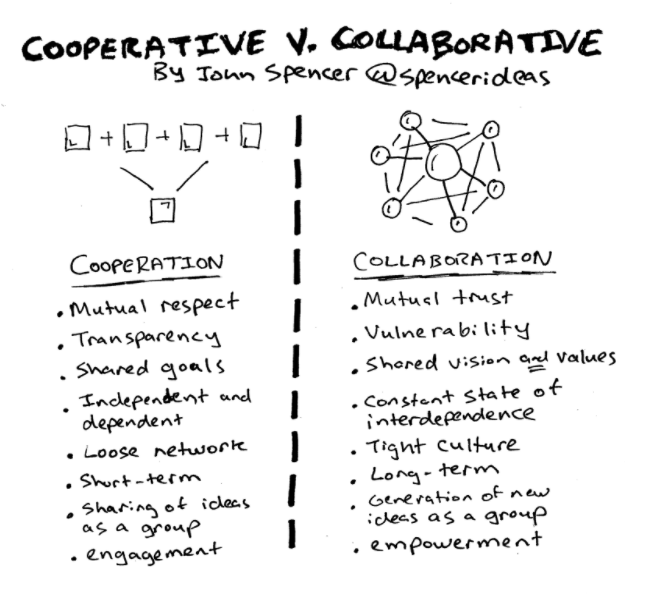 Collaborative LearningCollaborative learning is a learning process that brings learners together (including the teacher) and enables students to be responsible for their own learning as well as the learning of their peers. Collaborative learning is aimed at having students fully appreciate the process of building knowledge together and improving learning outcomes by collective knowledge and collective capability. Dillenbourg (1999) identifies the difference between collaboration and cooperation as defined by a degree in the division of labour. In cooperation, partners split the work, solve sub-tasks individually and then assemble the partial results into the final output. 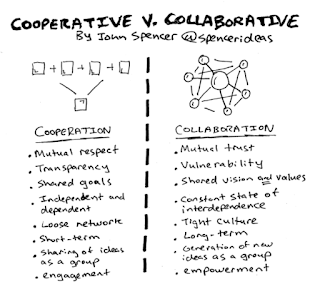 In collaboration, partners do the work 'together' (Dillenbourg, 1999). Similarly, Kozar (2010) uses the analogy of a pot luck dinner where cooperation is defined as the guests bringing separate dishes to contribute to the meal, and collaboration as a messier chaotic process where guests cook together to create the meal, but gain new knowledge or experience from the interaction. Dillenbourg P. (1999) What do you mean by collaborative learning?. In P. Dillenbourg (Ed) Collaborative-learning: Cognitive and Computational Approaches. Oxford: ElsevierKozar, O. (2010). Towards Better Group Work: Seeing the Difference between Cooperation and Collaboration.English Teaching Forum, 48(2), 16-23. 1. Learners need to be at the centre of new learning networks. 2. Every student should have access to learning networks. 3. Learning networks need to be interoperable. 4. All learners should have the literacies necessary to utilize media as well as safeguard themselves in the digital age. Aspen Institute Task Force on Learning and the Internet, Learner at the Center of a Networked World, Washington, D.C.: The Aspen Institute, June 2014.